Conjoint analysis attempts to determine the relative importance, consumers attach to salient attributes and the utilities they attach to the levels of attributes. This information is derived from consumers’ evaluations of brands, or brand profiles composed of these attributes and their levels. Determining the relative importance of attributes in the consumer choice process. A standard output from conjoint analysis consists of derived relative importance weights for all the attributes used to construct the stimuli used in the evaluation task. The relative importance weights indicate which attributes are important in influencing consumer choice. • Estimating market share of brands that differ in attribute levels. The utilities derived from conjoint analysis can be used as input into a choice simulator to determine the share of choices, and hence the market share, of different brands. 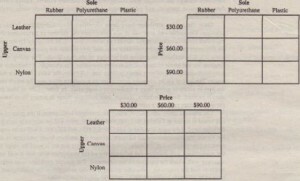 • Determining the composition of the most preferred brand. 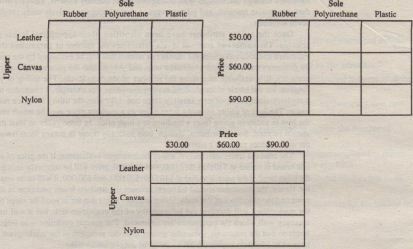 The brand features can be varied in terms of attribute levels and the corresponding utilities determined. The brand features that yield the highest 0 utility indicate the composition of the most preferred brand. Applications of conjoint analysis have been made in consumer goods, goods, financial, and other services. Moreover, these applications have spanned all areas of marketing. Attribute levels. 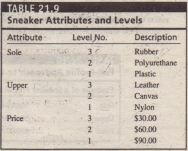 The attribute levels denote the values assumed by the attributes. Full profiles. Full profiles or complete profiles of brands are constructed in terms of all the attributes by using the attribute levels specified by the design. Figure 21.5 lists the steps in ‘con Joint analysis’. Formulating the ‘problem involves identifying the sentimentalizes and their levels. These attributes-and levels are used for constructing the stimuli to be used in a conjoint evaluation task. The respondents rate or rank the stimuli using a suitable scale and the data obtained are analyzed. The results are interpreted and their reliability and validity assessed. validation purposes. Input data were obtained for both the estimation and validation stimuli. 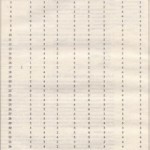 However, before the data could be obtained, it was necessary to decide on the form of the input data. 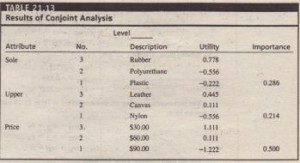 As in the case of MDS, conjoint analysis input data can be either nonmetric or metric. For nonmetric data, the respondents are typically required to provide rank order evaluations. For the pairwise approach, respondents rank all the cells of each matrix in terms of their desirability. For the full-profile approach, they rank all the stimulus profiles. 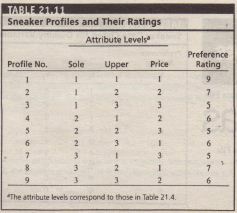 Rankings involve relative evaluations of the attribute levels. Proponents of ranking data believe that such data accurately reflect the behavior of consumers in the marketplace. The estimation of the part worths and the relative importance weights provides the basis for interpreting the results. Table 21.13 have only interval-scale properties, and their origin is arbitrary. In terms of relative importance of the attributes, we see that Price is number one. Second most important is Sole, followed closely by Upper. Because price is by far the most important attribute for this respondent, this person could be labeled as price sensitive. Several procedures are available for assessing the reliability and validity of conjoint analysis results. 1. The goodness of fit of the estimated model should be evaluated. 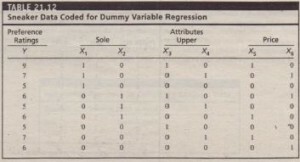 For example, if dummy variable regression is used, the value of R2 will indicate the extent to which the model fits the data. Models with poor fit are suspect. evaluate certain selected stimuli again. The two values of these stimuli are then correlated to assess test-retest reliability. 3. The evaluations for the holdout or validation stimuli can be predicted by the estimated pan-worth functions. The predicted evaluations can then be correlated with those obtained from the respondents to determine internal validity. 4. 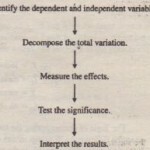 If an aggregate-level analysis has been conducted, the estimation sample can be split in several ways and conjoint analysis conducted on each subsample. The results can be compared across subsamples to assess the stability of conjoint analysis solutions. In running a regression analysis on the data of Table 21.12, an R2 of 0.934 was obtained, indicating a good fit. The preference ratings for the nine validation profiles were predicted from the utilities reported in Table 21.13. These were correlated with the input ratings for these profiles obtained from the respondent. The correlation coefficient was 0.95, indicating good predictive ability. This correlation coefficient is significant at a = 0.05.